Order goes from the top, left to right. 1. 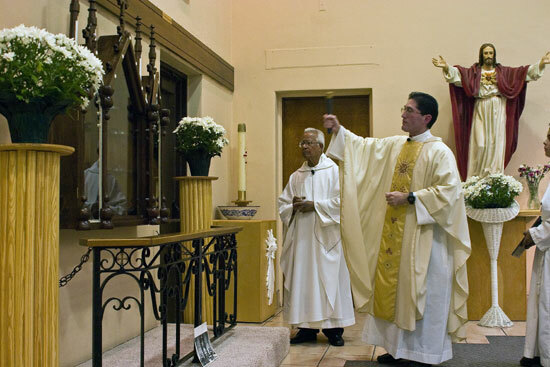 Father Ricardo Bauzá blesses the new reliquary at St. Genevieve Church on August 27, 2008. The banister in front of the reliquary is part of the communion rail from the old St. Genevieve Church. 2. The first relic to be placed in the reliquary are splinters from the true Cross of Jesus Christ. It was presented by Gilbert and Mary Lou Perez. 3. The relics of the saints are kept in the reliquary for public veneration. 4. Renee Allison presents the relic of St. Jude Thaddeus (on temporary loan until October). 5. Derek Rubio presents the relic of St. Bartholomew Apostle. 6. Marie and Juliana Castillo present the relic of St. Thomas Aquinas. 7. Sister Margarita brings the relic of Santa Teresa de Jesus. 8. The Romero family presents the relic of St. Catherine of Siena. 9. Edward and Rita Romero present the relic of St. Pius X. 10. Gloria Gonzalez presents the relic of St. Anthony of Padua. 13. Frank and Lou Ann Paz present the relic of St. Maria Goretti. 14. Tom Valverde presents the relic of St. Robert Bellarmine.